Snake Tray, a company that provides cable management, power distribution, boxes and enclosures for electrical busway, has launched three new products in the past year. First, the company’s Snake Connect is its newest power distribution system for access floors. Snake Connect provides a complete line of 30A modular wiring devices for raised floor applications. Snake Connect’s plug-n-play circular multi-pin connector provides fast installation, easy recon-figuration or relocation of power services and significant labor savings over conventional pipe and wire installations. It can fit in floors as shallow as two inches; all connectors are factory assembled and have a positive tab location to ensure secure and safe connection. Snake Tray also manufactures a series of boxes to compliment the Snake Connect system. The company also launched a new cable manager with a color-coded multiple pocket design, aimed at managing cables in hospital and healthcare environments. It provides up to 8 separate color-coded pathways to manage and identify a variety of cables, a specific need in operating rooms and other health care environments dependent on large numbers of life-saving electrical devices with varying power supply cables that must be identified and sorted by the cable’s out-side sheathing cover. Solar Snake Max is Snake Tray’s new patented cable containment system for utility grade installations of high voltage cables. The snap-together elements allow for code-compliant separation of power cables up to 2KV and eliminate the need for tools or field fabrication. 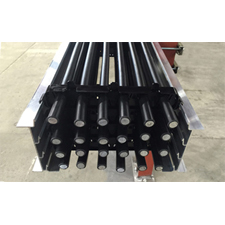 Construction times, Snake Tray says, can be cut in half, and the the product quickly mounts to any style of vertical pilings or poles and maintains code compliant separation of power cables up to 2KV.